CALMFORTER Premium Weighted Blanket- The Original Weighted Blanket and still the best. Our newest model is now available here on Amazon. 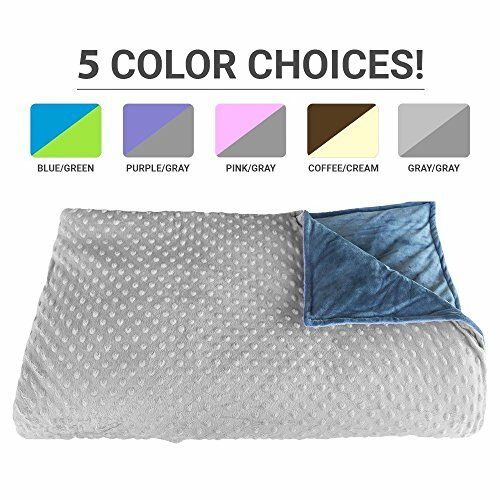 Why are CALMFORTER Blankets considered the best? Because we solved all the problems that exist with most weighted blankets on the market today. Most blankets are simply too small because of an outdated, obsolete weight calculation formula that keeps getting re-cycled instead of improved upon. Most blankets are simply uncomfortable, constructed as a 1 part blanket with lumpy square pockets and weights that rattle freely in the pockets like bean bags. These 1 part blankets are also very difficult to wash and dry and wear out quickly and often need to be discarded prematurely. Most blankets look very therapeutic, something most users are not fond of. Most suppliers produce one-off products with inconsistencies in quality and materials and lead times that range from 2 to 4 weeks and in some cases much longer. After more than 2 years of research and development, focus group testing, clinical input and life cycle testing the newest Calmforter was born. Is it the worlds best weighted blanket? We think so. So do thousands of satisfied Calmforter users everywhere. We hope you agree. Begin your journey to more restful sleep, less agitation, less stress and less anxiety today by investing in a Calmforter weighted blanket. The benefits of pressure therapy are well documented and we are so confident that you we be completely thrilled with the quality, comfort, and performance of the Calmforter that we back every blanket up with a 100% CUSTOMER SATISFACTION GUARANTEE. INDUSTRY EXCLUSIVE EVENFLOW(tm) TECHNOLOGY for the ultimate in comfort and relaxation. Enjoy quiet, even pressure reminiscent of a full body hug thanks to the Calmforters ingenious CloudSoft Polyfill(tm) and Stardust Microbead(tm) weighting system. ULTRA-LUXURIOUS MINKY FABRIC COVER- Outer cover is smooth as silk on one side while the opposite side features our unique SensaDot(tm) texture pattern for fingers and hands that like to fidget. NON-THERAPEUTIC APPEARANCE- Unlike most weighted blankets with highly noticeable lumpy, square pocket stitching, the Calmforter features a completely smooth, non-therapeutic look since the entire weighting system is completely hidden inside the cover. 2 PART CONSTRUCTION FOR EASY WASHING AND LONG LIFE- The outer cover easily zips apart for fast, easy washing and quick drying. No need to wash the entire blanket like old-style 1 piece blankets that take forever to dry and deteriorate quickly as the weights are repeatedly washed. GENEROUS 60" x 80" DIMENSION. The obsolete "10% of body weight plus 1 pound" guideline never did make sense since most blankets ended up being way too small. Use the amazingly versatile Calmforter your way and never come up short. Perfect for adults who want a full size blanket. Ideal for children; simply leave any un-needed weight bunched up at the end of the bed or on the floor. Protect your investment with a blanket that fast growing children will never outgrow. SELECT-A-WEIGHT VERSATILITY- Studies show that most users prefer a 12lb blanket, so thats exactly how we built the Calmforter. Want a lighter blanket? No problem. Use half the blanket for a 6 lb. weight and three quarters of the blanket for a 9 lb. weight. Need more than 12 lbs.? The Calmforter can accomodate that as well. Simply double up the blanket for twice the overall pressure. Only the Calmforter delivers this level of versatility and convenience.